Man, good thing it’s Friday. That’s all I can say. OK, first of all, I was mad about that Daily Double about a Dutch-named place (ugh, Spuyten Duyvil). And then Jennifer had the Penultimate Wager and totally blew it. More on that below. And don’t worry, you’ll be getting a video soon. The category is almost inconsequential given these scores. If Jennifer doubles her score, she’ll have 24,000. 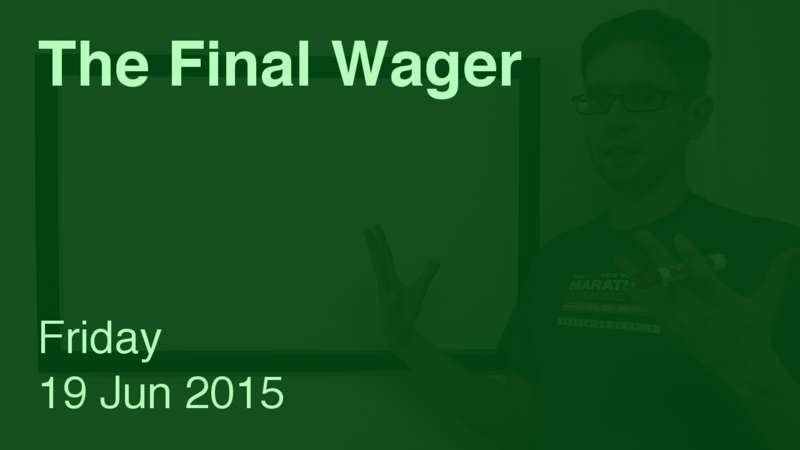 To cover this all-in wager, Brennan will need to wager 11,600. An incorrect response with that wager will leave Brennan with 800. To stay above his total, Jennifer can wager up to 11,200. Chad can wager up to 8,400. A successful doubling will put Chad at 18,400. To cover this, Jennifer should wager at least 6,400. Brennan would need to wager at least 6,000, but we’ll return to this only if there’s a good reason. If Jennifer is incorrect with that wager, Chad can wager up to 3,600 to stay above her total. Against Jennifer, Chad can wager at most 3,600. With a correct response, he’ll have 12,800. To cover this, Jennifer should wager at least 800. If she’s wrong with that minimum wager, Jennifer will have 11,200, so Chad should wager at least 2,000. Not sure what Jennifer is doing here, either – but that’s not really a surprise. Thanks in part to her Christmas present of a Penultimate Wager, Brennan completed his sweep of the week, taking down $126,404. It’s the $2000 clue in BRONTE-SAURUS – a category that had given our players problems (they missed the $800, $1200, and $1600 clues). The right play is to try for first place. I’d go between $2,401 and $3,600 – if she’s wrong with that bigger end, she’ll beat Brennan by a dollar with a zero wager if he goes for the lockout. With that $2,000 wager, she gains nothing if she’s right and falls to third anyway if she’s wrong. And we all saw how it shook out in the end. Jennifer just made the worst wager ever. Christmas present is right. This is so typical of the wasted efforts so many players make by not taking advantage of the gift that DJ’s represent. Keith, I agree with your Penultimate Wager analysis for Jennifer. Any wager that keeps her in second will also ensure she’ll be in Stratton’s Dilemma. Therefore like you said she ought to try for the lead, and if she’s wrong with your range then Chad would be in SD making it likely she’d be able to win on a triple stumper with a small enough wager.